It is another desperate effort, to increase the tourist trade in Puerto Rico. The mayor of Lajas has created a UFO airport (using tax dollars to build it) in an effort to attract more US tourists to his town. The photo above shows an actual road sign: intended to lure people into the town of Lajas. 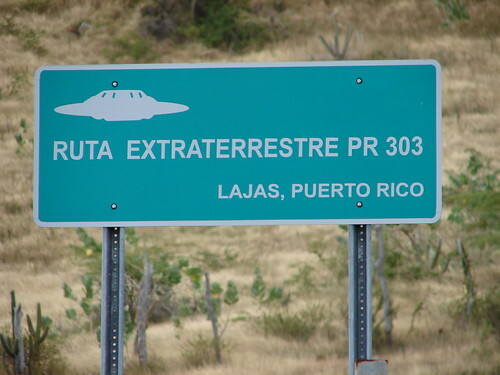 By the time the tourists figure out that there’s no UFOs or aliens in Lajas, they will have bought gasoline, coffee, a UFO souvenir, maybe a meal or two – before leaving the town limits. There is a strange justice in this. The US is bilking Puerto Rico…and the town of Lajas is returning the favor. “The mayor of Lajas has created a UFO airport (using tax dollars to build it) in an effort to attract more US tourists to his town.” …. really?? This is not bilking anybody. And it is not even false advertising because that is the name of the airport, UFO airport. Very clever. I just wish the writer of the article had given a destination to Lajas, such as “in western Puerto Rico” or “southeast of the mountains” or something to that effect. Good luck Lajas! Very creative way for people to get to know you!